Bitcoin broke out of the sideways trend it had fallen into upward in a nice display by the bulls. At the time of writing BTC is just over $7100. A daily candle close above $6800 is going to look very good for the bullish sentiment. The real challenge is coming close as Bitcoin is about to encounter the long term resistance that has been heavily defended by the bears since BTC reached its all time high of $19903 at $7400. If the bulls manage to move beyond this resistance they will encounter another point of resistance at $8200. The first attempt to move above $7400 is likely to fail. As such we will look to take some profits at this point. 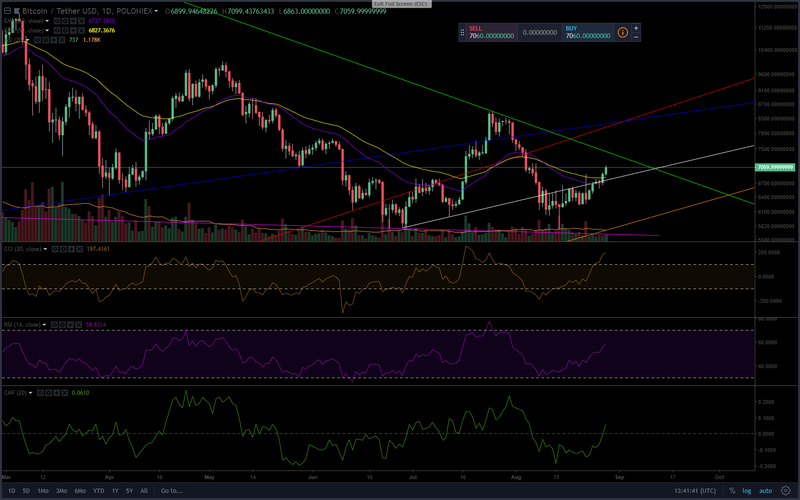 Once the pullback happens, and if bullish sentiment is retained at approximately $6800, we'll look for reentry for the next bull push that could spring board Bitcoin to the $8200 resistance. Overall the market is gaining positivity so we expect Bitcoin to continue on the bullish side. That said the long-term resistance is critical for Bitcoin to move above. A failure to do so would likely result in Bitcoin falling back to the previous strong support level of $6200.